Make sure you meet HMRC's self-assessment deadline. Freelancers reading this should be well aware that the deadline for filing your tax return is looming large (31 January). 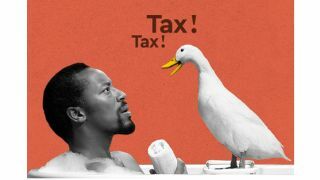 Last year, HMRC's poultry-themed campaign resulted in record rate of tax returns being filed on time, so it's no surprise this print ad is getting another outing this year. If your tax return is still pecking away at you, don't worry. Read on for 9 top tips to set you on the right path. For more advice, take a look at Contractor Calculator. First things first: If you are doing your own self-assessment (SA) and have a habit of leaving things to the last minute, then make sure your login details for the HMRC SA Service work. Check on the Gov.UK site and get it sorted if not. Getting the SA right can be tricky, and it is easy to make small mistakes. HMRC has sophisticated systems that detect these errors, which will result in an investigation if you get things wrong. Whilst you may have nothing to fear from an investigation, they can be time-consuming and costly to deal with. So it’s better to avoid one if possible. While employing a qualified tax advisor is an extra expense up-front, it may be worthwhile in the long run. If you name the tax advisor you used on your form there is less likelihood of you being investigated, because HMRC will assume that the professional has got things right. The fee for a tax advisor will vary depending on the complexity of your return – prices range from £50 for something simple to £400 for something more complex. In order to complete a tax return, you will need to know all your figures for total earnings in the past year, plus any bank interest, rental income details, and any dividends paid to you. If you don’t already have a tax statement from your bank for any interest earned, then apply for one quickly and/or ring your bank to get the figures you need. The format of the return does not change much year to year, and if the structure of your income hasn’t changed much then this year’s return will look very similar to the year before. Dig this one out and use it as a reference for the new one. If you have children and were paid child benefit during the year, then you will need to check whether either you or your partner earned over £50,000 in the year. If this is the case, then the money will be clawed back by the government. If you earn between £50,000 and £60,000, for every £100 you earn over £50,000 , you have to pay back 1 per cent of the child benefit you've received. If you earn more than £60,000, you have to pay it all back. There are questions about this on the return; make sure you get them right. A few years of getting this wrong could result in a hefty tax bill in the future. Your return is for the tax year ending April 2018. If you think you will earn less in the current tax year, then reduce the amount you 'pay on account', otherwise you will over-pay tax. But, beware, if you reduce this too much and end up earning more, HMRC will charge you interest on the amount you should have paid when you complete your next SA tax return. Your tax bill will be calculated in real-time and presented to you on-screen. This will show you the entire amount due for the tax year ending April 2018. However, this won't be exactly what you need to pay: you will have already paid monies on account, and if you under-paid, a balancing figure will be required, plus some interest. It’s good to do the submission early, then wait a few days for it to be processed. Then you can go back online and see the exact figure you need to pay. This will consist of a balancing figure for the previous year (which could be negative), and interest, and then a payment on account for the current tax year, which defaults to half the last year’s tax bill. Make sure you pay the bill before the deadline of 31 January 2019. Do this early, as HMRC’s systems get heavy use and can be known to very occasionally not work at key times. Build in some contingency. Download a digital copy of the return, and save that somewhere, along with a receipt for the payment you made. You'll be grateful when you have something to reference next year.